electro-music.com :: View topic - How to apply an LFO? How to apply an LFO? 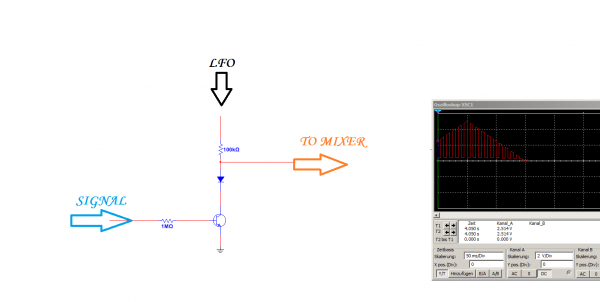 Posted: Sat Apr 14, 2018 4:34 am Post subject: How to apply an LFO? I’m looking to add an LFO to my circuit, to create a rise and fall in the volume of a drone. I’ve found a few nice ideas but what i’m not sure of is how to use it the change the volume. Is it as crude as instead of connecting the power pin to a chip straight to Vcc, connecting it to the LFO, so that the voltage input is fed and starved? Or should the LFO alter the volume control at the mixer for the chip? If it is the second option, then do you need to use a transistor somehow to effectively alter the resistance at the mixer? for changing the volume of a signal by using an LFO one use normally a vca. one of the simplest (opamp-free) VCAs i know is the DR-110 VCA. the resistor values are only examples, play around with them, the output is not buffered. after seeing my old idea, came the next (second pic) how to make it simpler and single supply. in addition your idea about feeding/ starving the Supply pin - but u have to do this by using the signal. the simulation did not have really worked here. the diode is meant as protection against negative voltages. although i would bet the first in the second pic will also work. 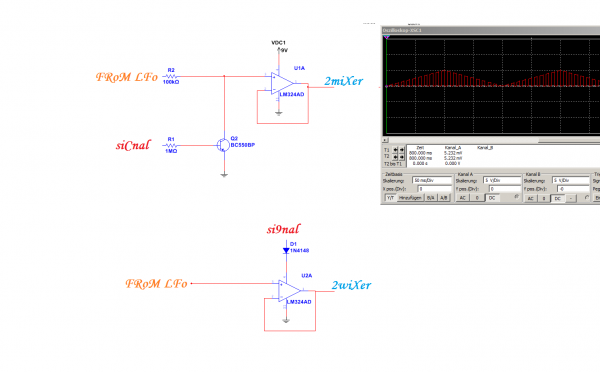 I used lm324 quad-opamp in the simulation, cos i dont know the single äquivalent.